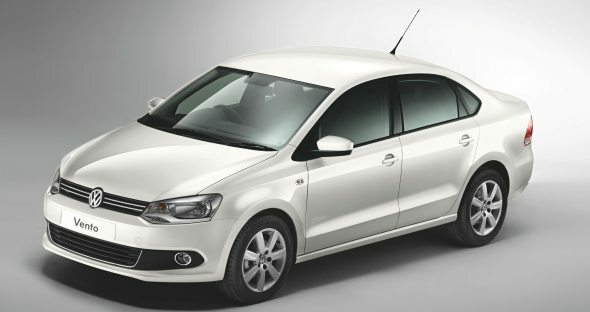 Volkswagen will launch refreshed variants of the Vento in the next couple of weeks. According to dealers CarToq spoke to, the new variants will get much needed features like steering mounted audio controls, a USB port and an upgraded music system. With these additions, the Vento top-end variant is aiming to woo the Verna buyer. Let’s see how. Volkswagen dealers stated that the new features might likely cause the price of the Vento to roughly rise by Rs. 20,000 to Rs. 40,000. The dealers also added that though they don’t have the Vento with new features on display, they have started accepting bookings. Deliveries of the new variants of Vento will likely commence next month. At present, the Vento Highline petrol (MT) is priced at Rs. 8.23 lakh, the Vento Highline petrol (AT) is priced at Rs. 9.21 lakh while the Vento Highline diesel is priced at Rs. 9.43 lakh. The inclusion of a USB port makes the Vento’s audio system a well equipped one which presently only has radio with CD-MP3 / WMA player and 4 speakers. The music system of the upcoming Vento will have mild changes such as a bigger screen and a smarter button layout. However, the new Vento will still miss out on an aux-in port (available in both Verna and City) and tweeters (available in the City). Exterior features: On the exterior, the Vento Highline is on the same page as the Verna and the City. All the three cars feature alloy wheels, front fog lamps, chrome on front air-dam and rear trunk. Volkswagen offers the Vento’s galvanized body with a six year anti-perforation warranty and front and rear tow hooks which are not available in the Verna and the City. The new Vento on the other hand will miss out on chrome door handles (offered in City and Verna) and LED turn-indicators on outside mirror, a feature offered in the Verna. Interior features: On the interior, both the Verna and the City come with leather upholstery while the Vento gets only fabric upholstery. The Verna gets high gloss black and wood inserts on the dashboard while the Vento comes only with a tone antiglare dashboard (black and beige). The Vento has automatic (Cliamatronic) AC with rear AC vents, dust and pollen filter, which is sorely missed in the Verna and the City. The Honda City too offers a few features that are not available in the Vento such as a fuel consumption display with warning, headlight (on) alarm and foot rest (useful during long drives). The Vento variants, after the hike, will be more feature-packed at a lower price than the top-end variants of Honda City and Hyundai Verna. The top-end variant of the segment leader; the Honda City V Exclusive MT is priced at Rs. 9.16 lakh while the Hyundai Verna SX (O) (petrol manual) is priced at Rs. 8.94 lakh and SX (O) (diesel manual) is priced at Rs. 10.44 lakh. Vento petrol manual: The upcoming petrol Vento Manual (MT) Highline (with new features) will likely be priced at Rs. 8.53 lakh* (adding Rs. 30,000 to present Highline price). Hence, the petrol Verna SX (O) will work out to Rs. 41,000 more and the Honda City V Exclusive will work out to Rs. 63,000 more than the upcoming Vento Highline. Vento petrol automatic: The upcoming petrol Vento Automatic (AT) Highline (with new features) will likely be priced at Rs. 9.51 lakh* (adding Rs. 30,000 to present Highline price). Hence the petrol Verna SX (O) will likely be Rs. 13,000 more and the Honda City V Exclusive will likely be Rs. 38,000 more than the upcoming Vento Automatic Highline. Vento diesel manual: The upcoming diesel Vento Manual (MT) Highline (with new features) will likely be priced at Rs. 9.73 lakh* (adding Rs. 30,000 to present Highline price). Hence the diesel Verna SX (O) will likely be Rs. 31,000 more than the upcoming diesel Vento Highline. Overall the new and improved Vento will make for a value for money car and although it lags behind the competition in terms of some premium features it will likely be less expensive as well. With these changes, the Vento is aiming to target the Hyundai Verna buyers, who are looking for a loaded car, but are looking for a more premium brand without paying more for it.